New Year's Eve Inspiration: Cue the Confetti! Cue the confetti, you guys! And throw the champagne on ice! Because tomorrow is New Year's Eve! Oh, and while you're at it, why not put together a little last minute New Year's eve party? Because what's not to love about good friends, good food, and good... did someone mention bubbly? Yep, it's time to roll out your bar carts, m'dears! Perhaps make a resolution or two, raise a glass and say, "Cheers!" And so imagine my excitement when I saw this fun and festive New Year's Eve inspiration pop up in my inbox. With design and styling by Lauryn Prattes Styling + Events and sweet snaps by Abby Jiu Photography, this is the stuff that New Year's Eve dreams are made of, you guys! Standouts for me include the coasters, stirrers, and custom laser cut pieces by Laura Hooper Calligraphy as well as those pretty pinwheels and decor by Shop Sweet Lulu! 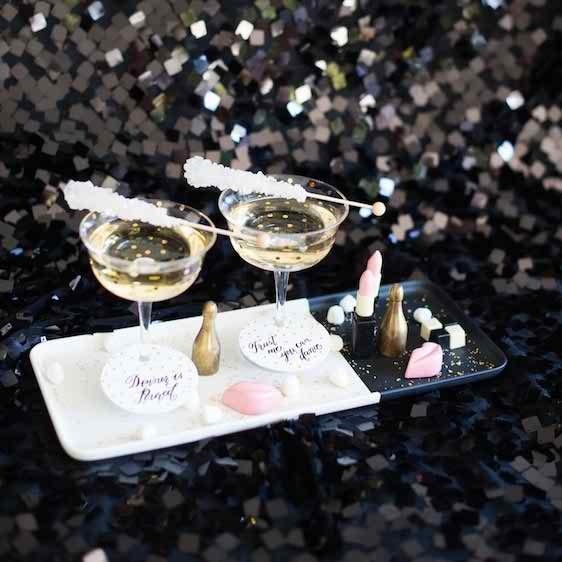 From the designer, "New Years Eve is about sparkle and celebration and so naturally..." "...we think nothing goes better together then champagne and decadent desserts." "We created the ultimate celebration station with everything you need to ring in the new year — confetti, champagne, and cake!" Fancy another? Oh, don't mind if I do! This bar cart styling is over-the-top amazing! Care for a slice of cake with your champagne? It's almost too pretty to eat! Oh, and can we all just talk about how darling these "trust me, you can dance," tags are? These little lipstick, champagne, and lip shaped chocolates were designed by the oh-so talented, Maggie Louis Confections! And these cakes? Um I seriously am blown away! Buttercream Bakeshop, you totally outdid yourself! And these "Press for Champagne," cookies? Buttercream Bakeshop, you're amazing! Want to know what also goes well with champagne? Rock candy! And these gold dot champagne coups make for a seriously pretty presentation! And I'm not going to lie... I for real can't even handle the cuteness! Seriously, I need a set of these stat... Here's to wishing you and yours a Happy New Year with lots of love! To this team of pros, I raise a glass to you, my friends! And I leave you with this fun little New Year's Eve DIY using foil accented laser cuts from Laura Hooper! 1) Order laser cuts from LHCalligraphy 2) Spray paint any color you like (we chose black) 3) While paint is still slightly damp to the touch tear pieces of gold leaf foil (link below) and apply randomly to the laser cut. Use a medium size paint brush to help tap the leaf down. 4) Rub over the gold leaf gently with the paint brush. This will make sure it’s secure as well as flake off little pieces of the gold leaf to give you a more interesting look. No Comment to " New Year's Eve Inspiration: Cue the Confetti! "